By Scott Gilfoid: A fight that will very likely in a brutal fashion on December 3rd is the bout between WBA World lightweight champion Brandon Rios (28-0-1, 21 KO’s) and John Murray (31-1, 18 KO’s) from England. I still can’t believe this awful mismatch has been made. I don’t know who dreamed this god awful fight and wished it upon the boxing public, but hopefully the matchmakers learn something from watching this affair. 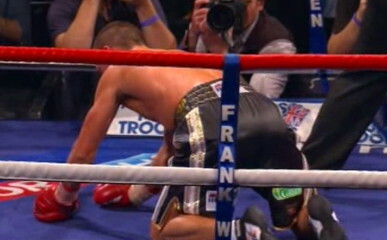 Murray doesn’t a ghost of a chance against Rios. This is one of those basic slaughters that make you wince. It’s kind of like watching one of those drivers training movies where they show some horrible car accidents to try and scare you into driving carefully. Murray doesn’t have the talent to keep Rios off of him for a second, and it’s going to be like trotting out Bambi to be set upon by a hungry wolf in Rios. Just watching Murray get torn apart by a limited fighter like Kevin Mitchell in his last fight is off putting enough to make you want to skip seeing this fight altogether, especially if you’re a devoted fan of Murray. This fight is going to be short, brutal and ugly. Murray is going to get his head blasted into the stratosphere by Rios and there’s not much Murray can do about it. He has only way of fighting and that’s to constantly plod forward in a slow one-paced manner. Murray will come forward with his lantern jaw thrust forward and just begging to be punched. Murray has taken ferocious punishment in most of his fights during his career, in particular his last two bouts against Mitchell and Karim El Ouazghari. Watching Murray’s head swivel around each time he was frightening. I knew then that Murray was ranked far too high for his talent level. I saw him as 2nd tier all the way and thought he wasn’t being done any favors by being ranked so high.